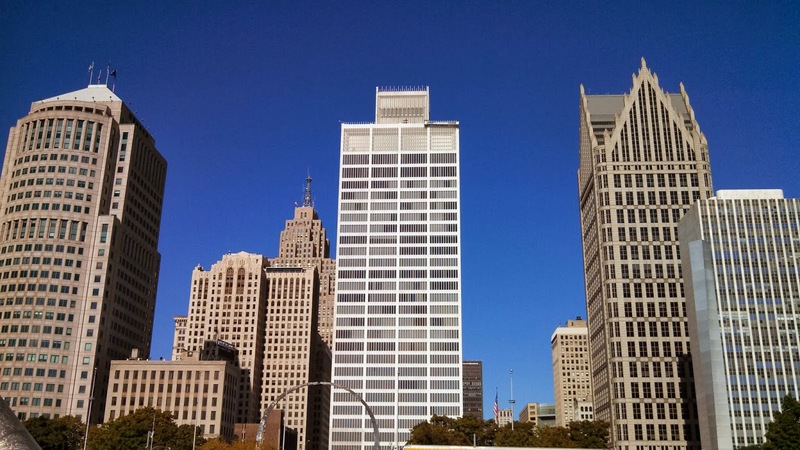 Driving south into Detroit from Ferndale on Woodward Avenue initially filled me with sadness, but as my wife and I traveled down Woodward I eventually began to feel pride and hope. I had not used Woodward to get to Detroit in years, instead opting for the ease and quickness of I-75. Woodward is a great American Avenue, but it has seen better days, at least in its northern stretch. The sadness immediately began after crossing 8 Mile Road when I looked over to the left and saw the old State Fairgrounds abandoned. Every year, my mom took us to the State Fair where I marveled at the sight of cows, rabbits, horses and pigs. It’s not that I had never seen farm animals before, but what amazed me was the juxtaposition of rural Michigan with urban Detroit. There was something strange, yet natural, about this marriage, but now as I drove past, I felt the pain of witnessing a terrible divorce. I knew the State Fairgrounds were empty, but the abandonment was not real until I saw it with my own eyes. I felt more sadness, but a little bit of hope, as we continued down Woodward through Highland Park and then back into Detroit. Spray-painted buildings and boarded up windows can be seen from Woodward, but there are churches and houses where people still worship and live. A pristine lawn attached to an even more pristine home on the corner of a neighborhood street is a reminder that people live here; that people love here; that people fight for here. 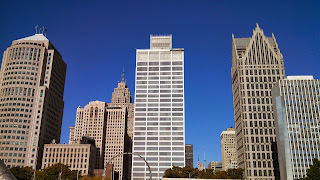 My hopes grew as we approached Wayne State University’s campus and continued towards downtown. This was a Sunday morning around 11:00, not exactly the hottest time for most cities. But there was movement in Detroit. It was not as busy as Manhattan, but it was not dead either. There were no Lions, Tigers or Red Wings games on this Sunday, but people were walking around and enjoying Detroit for its own merits. Our first stop was the birthplace of the Detroit Coney Island hotdog, American Coney Island, and their next door neighbor and competitor, Lafayette Coney Island [For a history of these two establishments, click here]. I had not been to these two Detroit Coney landmarks since I was in high school and wanted to try one dog from each. In the end, both dogs were excellent, but I give a very slight nod to Lafayette's Coney Dog. 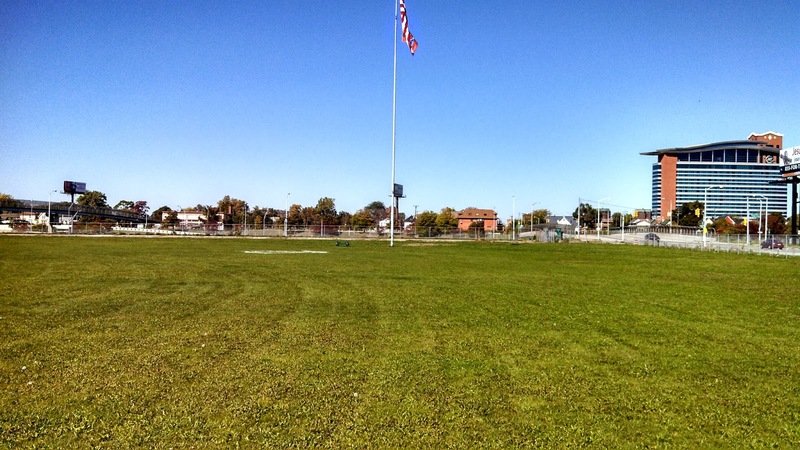 After my Coney taste test, we headed to Hart Plaza and the Detroit River. The RiverWalk exceeded my expectations. Facing the river, you have the Ambassador Bridge to Canada, Cobo Center and then Joe Louis Arena, home of the Red Wings, to your right and GM’s headquarters at the Renaissance Center on the left. We quickly walked to the Joe, but I wanted to see the other side of the RenCen and the improvements to the Detroit Riverfront. Pride swelled within me as I walked around the RenCen and saw what Detroit’s riverfront has become. 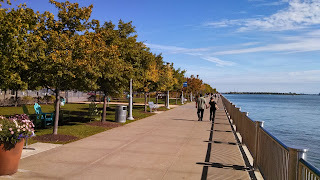 The blue waters of the Detroit River sparkled in the sunshine on right of the walkway with trees and grass lining the left. The grass is lined with chairs, benches and sculptures. As we continued past the RenCen, the walkway eventually has grass on the river side as well with lawn chairs for people to lay out on a sunny day. Several joggers and bikers were getting their exercise while enjoying the views of Canada and Detroit. Families with young children strolled along the banks of the river. Young couples held hands and relaxed on benches and chairs, lost in each other and perhaps the beauty of their surroundings. We next walked through Rivard Plaza with its carousel, beach volley court, fountain, café, and public restrooms. It was now early afternoon and more people were out on the RiverWalk. A small girl was running around barefoot in the sand of the volley ball court while her parents relaxed and watched from the side. She was having fun on a beautiful October day in Detroit while more children were playing and laughing on a nearby playground. After Rivard Plaza, we walked partway through Milliken State Park and Harbor. This stretch of the riverfront includes wetlands, a harbor, a lighthouse and entry to the Dequindre Cut Greenway. We only walked through part of this park because we wanted to see a few other places before heading home to see family, so we missed out on the lighthouse, harbor and Dequindre Cut. We loved our time on the RiverWalk and want to come back to see more. After walking back through Hart Plaza, we made quick stops to pay our respect to the sculpture of Joe Louis’s fist and the Spirit of Detroit statue before hopping in the car to drive to The Corner where the Tigers once played. I loved Tiger Stadium as a kid because it oozed tradition and because I knew that I was sitting in the same stands where my dad watched the Tigers as a kid in the 1940s and 1950s. The stadium was vacant but still standing the last time I had been to Michigan and Trumbull. Now, the field is taken care of by locals, called the Navin Field Grounds Crew, who mow the grass and keep the infield clean and the foul lines painted. 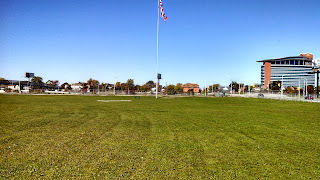 The original gates on Michigan Avenue are still there, and the flagpole is still in center field with the Stars and Stripes still raised high and flapping in the wind. I stood off to the side in the foul territory in right field where I once sat in stands and watched my Tigers play. 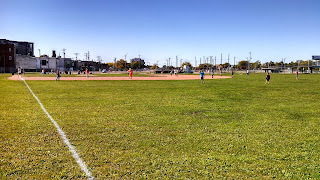 I did not want to interrupt the kids’ game, so I strolled over the foul line and stood in right field and just imagined the smell of that old stadium. I could hear the crack of the bat as Kirk Gibson or Lance Parrish knocked a home run into the stands and could hear Ernie Harwell's beautiful old voice say, "That one is long gone!" My focus shifted back to the fun the kids were having on this field. These kids running around on this magnificent field made me proud to be from Detroit and gave me hope for the city of my birth. The abandoned Michigan Central Station hovers nearby, but that is Detroit’s past. These kids are Detroit’s future. They control the city’s destiny, even though they do not know it yet. 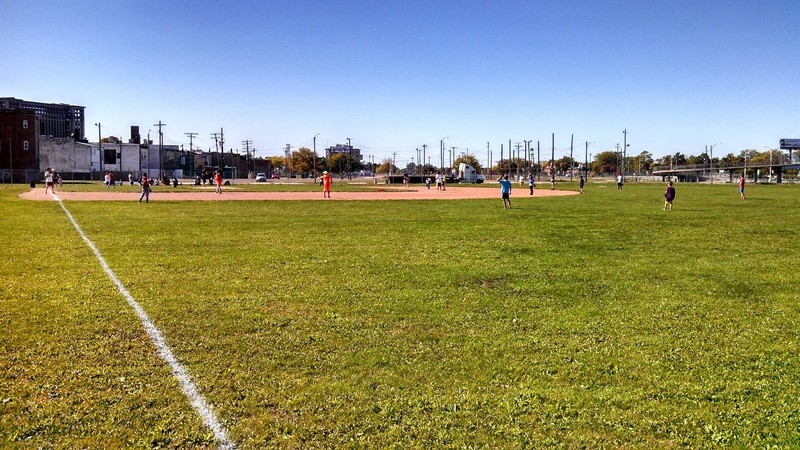 Instead of filling them with sad stories of Detroit’s grand past, just let these kids have fun and play ball on The Corner or walk along the Detroit River on a sunny day in October. They will love Detroit for it, and they will work to make it better than we can ever imagine.